My 83 year old father-in-law returned from a recent outpatient visit to his primary care provider with two customized handouts - a transition of care summary detailing problems/meds/allergies and an opt-in consent for the exchange of that care summary over the state Healthcare Information Exchange, the MassHIWay. We discussed them over dinner. As I’ve written about several times, the Meaningful Use Stage 2 Transition of Care and Patient Access requirements are hard since they require environmental and cultural changes. There’s no magic bullet to implement them, it just takes time and diligent effort, one patient at a time. His opt in consent is signed and his data is viewable throughout Massachusetts for care coordination, population health and quality measurement. The numerators for Stage 2 are being incremented every day. As I watch the rollout in Massachusetts I see an amazing trajectory - over 150 healthcare organizations are on the MassHIWay, using the standards required by Meaningful Use Stage 2 certification. The key to our success has been low cost, a flexible on boarding approach, and common patient/provider educational materials shared by all. 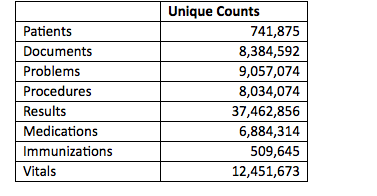 Here are the actual statistics of what BIDMC has sent over the past year using Meaningful Use Stage 2 standards. As I described in a previous post, this is more evidence of interoperability that’s real. How do we ensure that extends across the industry? When I meet with many vendors, they measure success when the sale is made or when the go live occurs rather than when adoption achieves the outcomes desired. Today I’m at KLAS in Salt Lake City with several EHR vendors discussing “magical thinking”. Over the course of the day we all concluded that we need to redefine success based on outcomes - mutually aligned self interest that pays vendors for achieving commonly agreed upon goals. The CIO wants improved quality/efficiency, fewer emails, and great communication. The vendor wants to make a sale, achieve customer success/reputation, and grow market share. Some vendors have recast their business as a process delivery rather than product delivery. We can all learn from that. My father in law has demonstrated the Meaningful Use policy outcome - an understanding of his care and respect for his privacy preferences. As we think about the next steps to enhance interoperability, industry stakeholders should forge collaborative relationships outside of regulation that align incentives to achieve the results we all want.